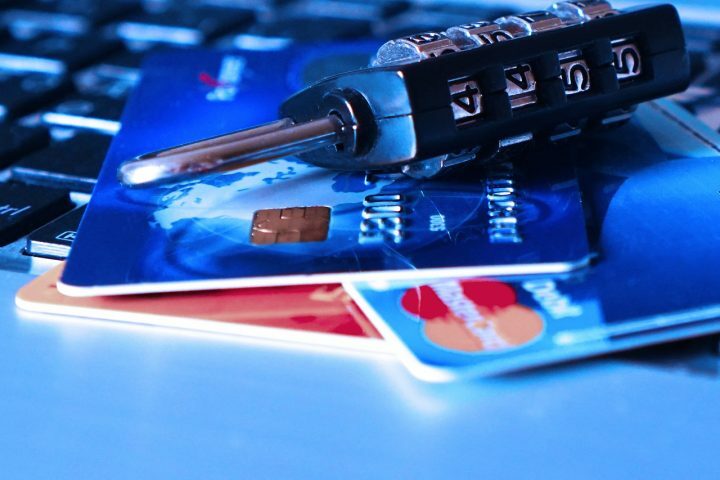 The Federal Trade Commission (FTC) documents consumer complaints about fraud and commercial abuse of all kinds — from violations of the “Do Not Call Registry” rules to identity theft, impersonating the IRS, fake sweepstakes, and credit-card fraud. For journalists, one of the more underutilized federal data sources is the FTC’s Consumer Sentinel Network, which gathers data from a wide variety of sources, including state attorneys general, the FBI and more local entities such as Better Business Bureaus. The Sentinel Network data itself is available only to law enforcement, but top-level findings and state- and metro area-level data are published on an annual basis. 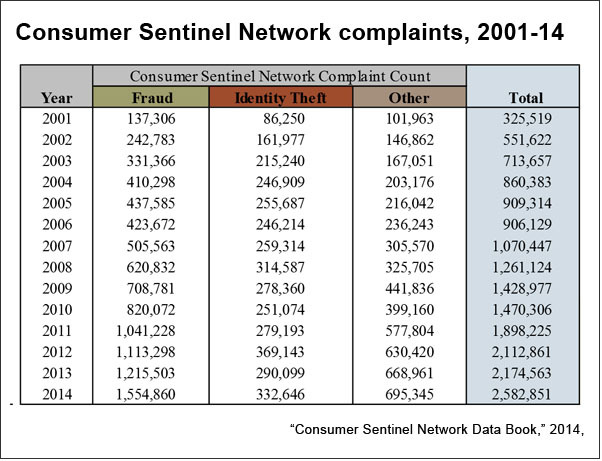 The FTC’s latest report, “Consumer Sentinel Network Data Book for January-December 2014 ” was released in February 2015, and shows evolving patterns of complaints across the United States. Reporters looking to assess complaints in their state and specific local areas can refer to individual statistical breakouts, beginning on page 21. The FTC makes clear that these are “unverified” consumer complaints and are not based on a representative survey or sample. Nevertheless, the data are revealing and can serve as the basis for reporting in the field. During 2014, there were more than 2.58 million complaints (excluding do-not-call complaints), representing a 16% increase over 2013. Of these, fraud complaints were the most common (60%), followed by identity theft complaints (13%); debt collection (11%); impostor scams (11%); telephone and mobile services (7%); banks and lenders (5%); prizes, sweepstakes and lotteries (4%); auto-related complaints (3%); shop-at-home and catalog sales (3%); television and electronic media (2%); and Internet services (2%). Among the fraud complaints, the average amount lost by alleged victims was approximately $2,000, with a median figure of about $500. In total, approximately $1.7 billion was lost by self-reported victims of fraud. The most common methods of initial contact by fraud perpetrators was telephone (54%) and e-mail (23%). Florida was overwhelmingly the leader in per-capita complaints, with 1,007 for every 100,000 state residents. Georgia, Nevada, Delaware and Michigan rounded out the top five. Florida was also the leader in rates of identity theft reported, with 186.3 complaints per 100,000 people; Washington, Oregon, Missouri and Georgia followed on that list. The metropolitan areas with the most fraud complaints were: Sierra Vista-Douglas, Ariz.; Homosassa Springs, Fla.; Colorado Springs, Colo.; Weirton-Steubenville, W.V.-Ohio; Bellingham, Wash. Given privacy concerns, it remains unclear how much of this data — particularly the names of entities and businesses accused of fraud — might be subject to the Freedom of Information Act (FOIA), and a 2014 Washington, D.C., District Court legal decision possibly opens up one new avenue for inquiry. For its part, the Consumer Financial Protection Bureau, which feeds data into the Consumer Sentinel Network, is now releasing the specific names of banks, mortgage companies and other businesses that are the subject of consumer complaints. And it is possible that the state agencies providing the underlying data to the Sentinel Network might be open to FOIA requests. Related research: A 2014 study published in Psychological Science, “Contrary to Psychological and Popular Opinion, There Is No Compelling Evidence That Older Adults Are Disproportionately Victimized by Consumer Fraud,” gathers evidence relating to questions about age cohorts and relative levels of susceptibility. There is also an evolving academic literature on how warnings and other techniques might reduce susceptibility among consumers. Citation: "Consumer Sentinel Network Data Book for January-December 2014," Bureau of Consumer Protection, Federal Trade Commission, February 2015.